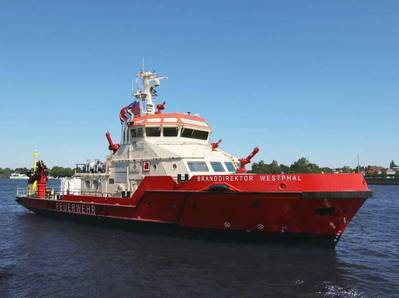 A state-of-the-art propulsion system helps to maek Branddirektor Westphal as one of the most high-tech fireboats in Europe. The vessel, operated by Flotte Hamburg GmbH & Co. KG, a wholly-owned subsidiary of Hamburg Port Authority (HPA), and built at the Fassmer shipyard in Lower Saxony, is scheduled to enter service in the Port of Hamburg shortly. The new vessel is fitted with SCHOTTEL thrusters: two SCHOTTEL Rudderpropellers and two SCHOTTEL Transverse Thrusters. The Branddirektor Westphal is powered by two Caterpillar C18 engines, each with an output of 500 kW. Each of the engines drives an azimuthing SCHOTTEL Rudderpropeller type SRP 190 FP with a propeller diameter of 1,350 mm and an input power of 500 kW. This enables the fireboat to reach an open-water speed of 12 knots. In combination with the two Rudderpropellers, two electrically driven Transverse Thrusters of type STT 170, each with a power output of 330 kW, enable optimal maneuvering and DP capability during firefighting or rescue operations. The new emergency vessel of the Hamburg Fire Brigade is 44.14 meters long and 9.8 meters wide. It has three fire pumps that can spray up to 180 meters or to a height of up to 110 meters. Their pumping capacity of up to 120,000 liters of water per minute is three to four times that of the existing Flotte Hamburg fireboats. The pumps also supply three water cannons and three combined water and foam nozzles. In addition to firefighting, the vessel, named after Johannes Westphal, Hamburg’s first chief fire officer after the Second World War, is also equipped for rescue and relief operations.